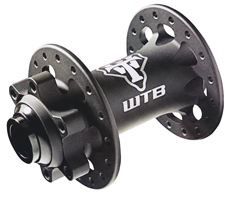 The biggest news from US component maker WTB for this year is a hub QR15 front with 15 x 100 millimeter thru-axle. This hub was developed especially to be compatible with QR15 standards. However to get more durability WTB developed stainless bearings that are now used in QR15 and all LaserDisc front and rear hubs. This season the European branch of WTB also started to market two types of rims in Europe, SX and DX. The disc-only SX24 weighs a little more than the top-level XC race rim at 460 grams, but costs just a fraction of the price. It is also available in a 700c model that weighs 505 grams. The DX23 features WTB’s well-known rim quality at an entry-level price point. The 23-millimeter wide XC rim features a CNC braking surface and wear indicator. The sidewall wear indicator, used for the Dual Duty, FX and DX series rims, is a groove in the braking surface. When this groove is no longer visible it indicates that the rim needs to be replaced due to sidewall wear from the use of rim brakes.